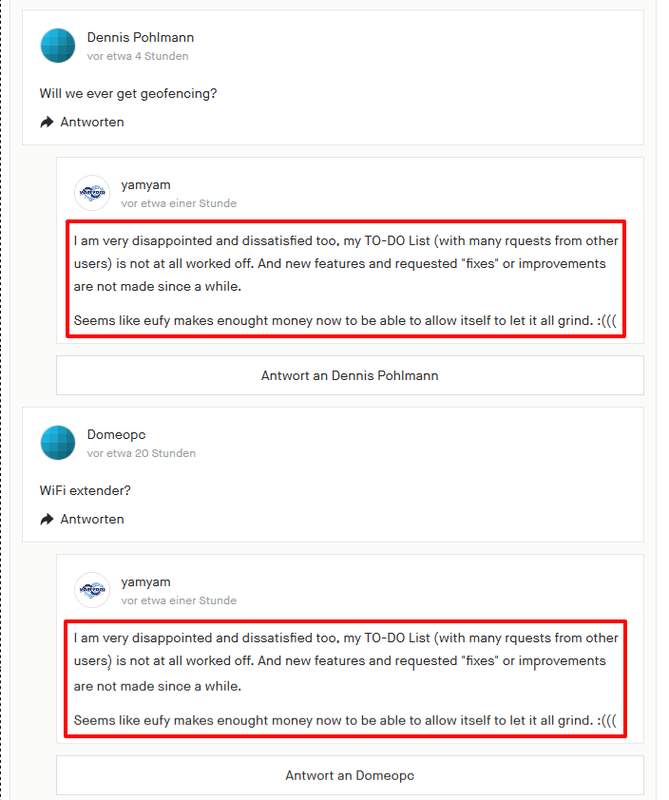 This post/thread of me has been herewith copied/moved from the kickstarter campaign page to this forum, to be able to better keep track of it and to also let other users (who havn't been part of the campaign) known of it. Adding ACTIVITY DETECTION ZONES for the cams, if possible. Adjustable TIMESTAMP color, i.e. beeing able to change the color of the timestamp from white to any other color or even to change the outline-border of the timestamp (if want to keep it white) to be able to read it easily even on very bright backgrounds like clouds, sky, white background. Make recorded videos also swipeable in FULLSCREEN/LANDSCAPE mode in the app. Option to show BATTERY STATUS INDICATOR IN PERCENTAGE, rather than 5 bars in the app. Regardless of whether we use the "BAR indicator" or "PERCENTAGE indicator" for the battery life, it would be helpful if the indicator would show the current "health/status" even WHILE charging! Currently only the green "charging symbol" is showing up while charging, but this symbol doesnt show the current state of charge. This would be useful, no matter if charging by wire or solar, to see how far the current charging process is. Expressed in a simple way: Just turn the current used symbol and the future percantage symbol GREEN while charging and let it show the current battery life (instead of like it is currently just showing a static charging symbol). And please add an option to be able to disable the "red charging light" at the cam itself. If charging by solar this will unnecessarily just cost energy and if the cam is loading or not is still viewable in the app. MARK UNSEEN/UNOPENED recorded videos in the app (i.e. bold) so its much easier to check which videos already have been seen/checked in the app and which never been opened. FIX COLOR OF STATUS/NOTIFICATION MESSAGES Example: No matter if a download failed or have been successfully downloaded, the poping up message has the same red (background) color! ... negative messages like failing downloads should be RED, positive like successfull download messages should be GREEN. This would help to more easily verify and take notice of poping up messages and their content. The ability to have Alexa or google to set the Eufycam to home/away mode and to silence alarms. Not many people have Alexa/google with a video screen so this gives us more options and convenience. There should be an optional "max-time setting for manual recordings", which can be set from 1 min to unlimited. Currently is seems that after 5 min in max, the recording gets stoped. He described it as: "My biggest complaint is the high number of unneeded or excessive event recordings in occasional high activity/traffic areas and wish there was a quick and simple "Snooze/Ignore" dropdown menu via App which would apply to the whole system OR selected cameras for a user defined time interval (30-min/60-min/90-min/6-Hours etc). After the "Snooze" expires the system would revert back to the previous detection mode / ready status." He described it as: "It´s not possible to blurry out parts of the recorded are. As an example neighbours garde, or the public street. In some countries of the EU its not allowed to record this." DONE? (Needs to be tracked and investigated in the future): Check and Fix the out of sync issue of video/sound which appears from time to time. 8 Option to show BATTERY STATUS INDICATOR IN PERCENTAGE, rather than 5 bars in the app. 8 Option to show BATTERY STATUS INDICATOR IN PERCENTAGE, rather than 5 bars in the app. Regardless of whether we use the "BAR indicator" or "PERCENTAGE indicator" for the battery life, it would be helpful if the indicator would show the current "health/status" even WHILE charging! Currently only the green "charging symbol" is showing up while charging, but this symbol doesnt show the current state of charge. This would be useful, no matter if charging by wire or solar, to see how far the current charging process is. Expressed in a simple way: Just turn the current used symbol and the future percantage symbol GREEN while charging and let it show the current battery life (instead of like it is currently just showing a static charging symbol). And please add an option to be able to disable the "red charging light" at the cam itself. If charging by solar this will unnecessarily just cost energy and if the cam is loading or not is still viewable in the app. 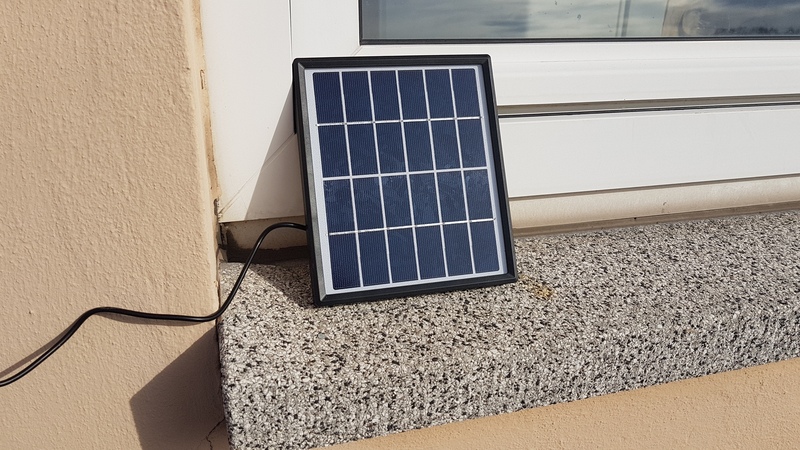 Reason: I am currently making tests with a quite good solar panel (which even is charging on cloudy/darker moments) and it would be helpful to see "how much" it charges. So first of all i would appreciate a percantage indicator first (more meaningful than 5 bars) and then would see the percantage value increasing LIVE while charging. This way i could verify how much the panel is charging with full solar radiation and the difference when it is cloudy and much darker. Just one little "teaser preview" picture from my solar panel testing. Check out my detailed solar panel test coming up soon! Could you please keep us updated frequently on WHAT you are currently working and IF you are still interested in working off those lists and wishes? It would be nice if you keep track of this thread and would post some comments or update-notes which points of the list are shortly before "done" by the next firmware or app update. Almost none of the above laborious and loving listed (currently) 18 points have been realized in the past several months and eufy did not even say something about it or answered or commented or liked it. Most if these points and improvements are kinda easy to realize or implement. Since the cam is in retail and eufy makes money updates and improvements reaches almost zero point. I am very dissapointed in the meanwhile. that not much will happen here anymore.